Burr served on George Washington’s staff during the American Revolution, but he was transferred after irritating the commander in chief. He became a prominent New York attorney, then entered politics, tying in 1800 with Thomas Jefferson in electoral votes for president. Thanks to Alexander Hamilton’s determined opposition to Burr, Jefferson won and Burr (under the then-prevailing election laws) became vice president. In 1804, Hamilton again worked against Burr—this time depriving him of the governorship of New York—and Burr (still sitting as vice president) killed Hamilton in a duel. 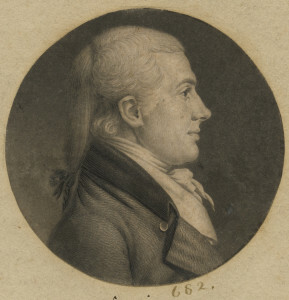 After warrants were issued for Burr’s arrest, he fled to Philadelphia. He conspired with U.S Army general James Wilkinson to invade Mexico, establish an independent government there, and (possibly) foment the secession of the American West to join the empire they would found. Burr was arrested, tried for treason in 1807, acquitted, but publicly ruined. He fled to Europe, returned to New York four years later, practiced law, and wasted his fortune.